Why should I use Anti-Wrinkle Injections? As your skin ages, it loses its elasticity. Constant movement of the brow muscles or repeated frowning and squinting can create deep lines and wrinkles over time. Anti-wrinkle injections work on relaxing these dynamic muscles that are responsible for wrinkle formation. How are the injections administered and how does it work? A natural, purified protein is administered via a series of tiny injections into the muscle that causes these unwanted lines. This protein, after several days, relaxes the movement and pull of the muscles causing and the skin to gradually flatten out. This leaves a rejuvenated and more youthful appearance, free from wrinkles. 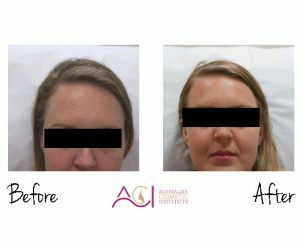 This is a simple, quick and minimally invasive non-surgical treatment which delivers dramatic results. The procedure takes only about 10 minutes and you can head straight back to work or whatever else you have planned for the day. The results can be seen within days and may continue to improve for as long as two weeks.